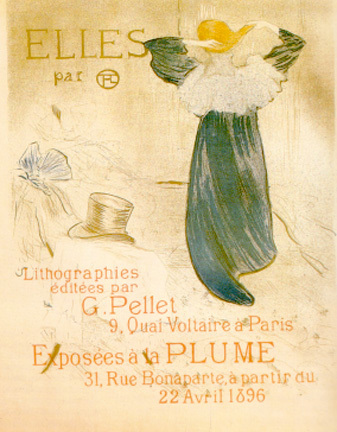 "Elles" are "Them" - meaning women of the oldest profession, as is made clear by the subtle means of placing a gentleman's hat on top of some female underclothes. A group of Toulouse-Lautrec's scenes from the brothels of Paris was gathered in a portfolio published with this title; for the occasion, these ten plates were also shown to the public in the salon of La Plume magazine. This poster announces both the publication and the exhibition; the same design also appeared on the cover (in black and white) and the frontispiece (color, without the text) of the portfolio.